AUCTION HOUSE INGLIS HAS THROW OPEN THE DOORS TO ITS BRAND NEW RIVERSIDE STABLES, CLOSING THE BOOK ON MORE THAN A CENTURY OF SALES AT NEWMARKET. Guests at the Inglis Classic Yearling Sale, which begins tomorrow, are in for a treat especially those who’ve never stepped foot inside the $140million Riverside Stables at Warwick Farm. The purpose-built complex includes stabling for 880 horses, a huge auditorium and sale ring, parade grounds with three different surfaces – bitumen, synthetic grass and crushed granite – and a luxury hotel complete with a restaurant, day spa, bar and roof top swimming pool. In a word, it’s stunning but it’s the finer details that are most impressive. 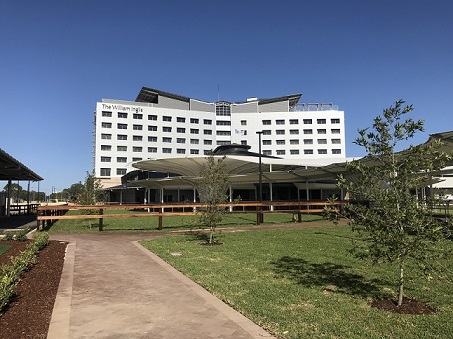 It’s been a decade in the making and every aspect of the facility has been carefully considered from the recycled timber of the old Newmarket stables to the name of each hotel room. It was back in 2008 newly appointed Inglis Managing Director Mark Webster first floated the idea of a move away from Randwick’s Newmarket complex, the facility Inglis had owned and operated from since 1906. He was with company leaders at a strategy session in Bowral and declared they would need to find a larger site within the Sydney Basin to secure the long-term future of Inglis. The Inglis Riverside Stables is an impressive complex from all angles. Inglis adopted the bold plan and just one year later purchased a 26-acre site next to Warwick Farm Racecourse from the Australian Jockey Club (now Australian Turf Club.) It was chosen because of its central location – 25 minutes from the airport, 40 minutes from Randwick, 25 minutes from Rosehill and 20 minutes from Badgerys Creek, where Sydney’s second airport will be built. Inglis proudly announced its acquisition and intent to eventually relocate the business to the new site. There were rumblings of disapproval but with no date set for the move there was no strong opposition. Horse selling is a seasonal business so it was important for Inglis to create a world class auction facility that could be utilised for other purposes. Several barns have hinged front walls which can swing open in seconds to create an exhibition booth. There’s a landscaped garden pavilion overlooking the racetrack which is ideal for weddings and any sort of conference or presentation could be staged in the auditorium. “I’ve been riding this project from the start and I’m a tough judge but the way it has come together has exceeded my expectations,” Mr Webster said. Inglis has also taken great care to ensure the old Randwick site will be respected. They had the land rezoned for a residential village incorporating some retail and commercial space as well as a central park. The site was then sold to Cbus – a large superannuation fund owned by more than 700,000 Australian workers. Construction of the Riverside Stables began in late 2016 and cynics reared their heads again, but Inglis swiftly converted them to believers with free ‘hard hat’ tours of the site. The William Inglis Hotel opened with a rush of bookings on 22nd January. Each of the rooms is named after a star who has passed through the Inglis sale ring with memorabilia incorporated into the décor. 22 of the rooms are suites and the grandest of them all is named after unbeaten world champion sprinter Black Caviar. The hotel was booked out months ago for the duration of the Inglis Classic Yearling Sale which will be the first test for the new complex. The sale will begin immediately after the Inglis Race Day at Warwick Farm tomorrow (Saturday, 10th February) which is headlined by the $250,000 Inglis Classic. Demand at the sale is expected to hit an all-time high partly due to the introduction of two new races in 2019 exclusively for Inglis graduates. The $2million Inglis Millennium will become the second richest race for two-year-olds in the Southern Hemisphere after the Golden Slipper, while three-year-olds can compete in the $1million Inglis Sprint. A $3million Inglis Triple Crown Bonus is also available to any horse who can win either the Inglis Nursery or Inglis Banner in 2018, as well as the Inglis Millennium and Inglis Sires Produce in 2019. “The Inglis Millennium will provide our clients with another great lead-up option into the Blue Diamond and Golden Slipper, just as the Inglis Nursery has proven in recent years with She Will Reign, Extreme Choice and Mossfun winning the Nursery on the way to Diamond or Slipper glory,’’ Mr Webster said. This article was originally published in Racing NSW Magazine.